The CuZn Arsenic Shower Filter has a 10" bottom media to provide the dwell time needed to remove arsenic, arsenate and arsenite. The top media includes carbon to polish the water for showering. 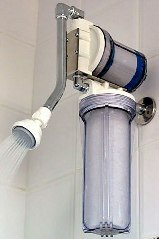 The shower filter should last roughly 9,000 gallons for all forms of arsenic, including organic arsenic and inorganic arsenite and arsenate at a reading of 40ppb. The replacement filter is $120.